Designers try to bring as much offline experience into online world whenever possible to ensure the ease of use. However, when speaking of navigation, the experience in brick-and-mortar store and online store are quite different. Have you ever noticed how they place the bread section you aim for somewhere at the end of the shop to make you spend more time and buy some other (not necessarily required stuff) on the way? It’s not the case with online stores: once a customer feels disoriented — they close the site and go elsewhere. Standard Magento navigation is pretty well designed. It is easy to use, predictable and consistent. Built-in navigation includes the logo linked to the homepage, clickable user account and cart elements, top navigation bar with categories, breadcrumbs, layered navigation, footer navigation and sitemap.We have already posted an article about navigation issues in online stores. This time we will cover the navigation on Magento websites: what’s in the box and how standard Magento functionality may be improved — everything generously spiced with examples from successful online stores. With the LOGO, everything is pretty clear. It’s the north star of any Magento website, the most prominent element that leads you to the home page no matter how deep into a website you’ve gone. MY ACCOUNT and MY CART elements are found at the top right of the page. Site visitors can easily access the account links and the shopping cart pages anytime they need it. 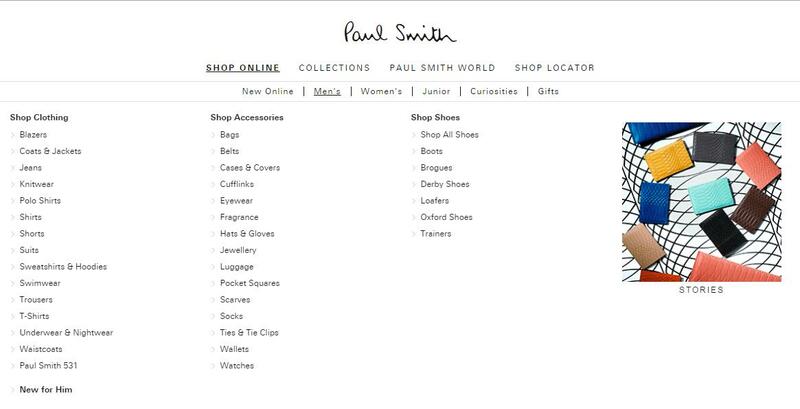 MAIN MENU in Magento (the first top horizontal row of links) usually contains categories, subcategories and sub-subcategories — as many as you wish. They are easily created and managed in the backend of the site. If the category tree gets too big, there are two ways to go: simplify the structure or implement the mega-menu. We will never get tired of praising mega-menu because it’s the best way to show your stuff in a very nice and compact way. In addition, it allows you to promote your products and include images to attract attention. 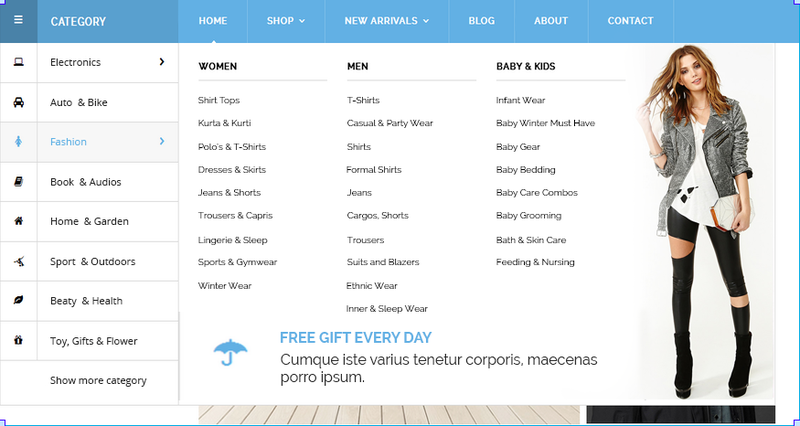 If you want to incorporate mega-menu into your website (which you absolutely should do!) — an extension like Mega Menu by Rootways Inc can help. 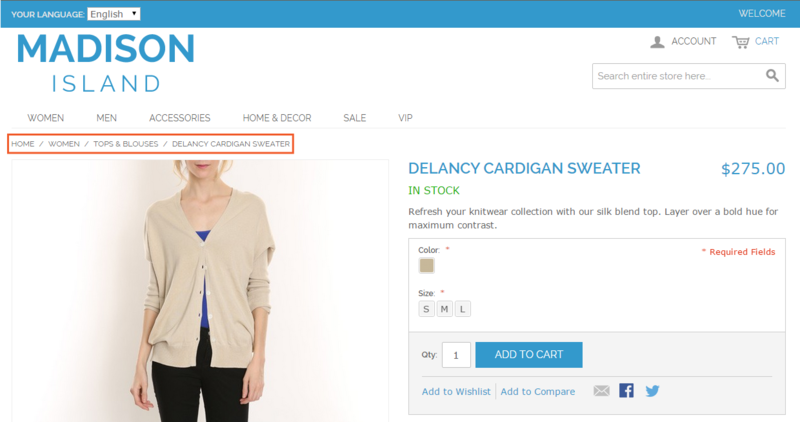 Main navigation bar in a standard Magento store is placed at the top. But if you look at the sites of such leading ecommerce companies like Amazon and eBay, you will see that they have the vertical main navigation. Yeah, it’s a trend. No doubt. But, also it’s a very convenient way to display product categories, when you have a very extensive product catalog or need to feature links to other important pages at the top of the site. In this case, Vertical Menu extension could be pretty handy. But do not expect a lot from this module — its functionality is very limited. Except the sidebar placement, you won’t get any bonuses. What is also worth mentioning when it comes to main menu design — so-called hamburger menu hiding navigation options off the screen. It has been widely adopted on many websites. However, being a vital solution for mobile sites, it still attracts criticism when used on desktop devices. Though users become more and more familiar with this navigation element, it is not considered to be a good practice for ecommerce sites. Such big brands like Fred Perry, that have a very specific up-market target audience and don’t really need to follow any best practices for usability, do as they please: huge photo of Bradley Wiggins on the first screen, hamburger menu on the left displaying the main departments. But, if you are not a well-known brand, think twice before implementing hamburger navigation on your site. Such a tiny but very important feature as BREADCRUMBS shows your customers the exact place of your site they are in. It’s a standard feature for Magento and in addition to usability it’s also good for SEO. 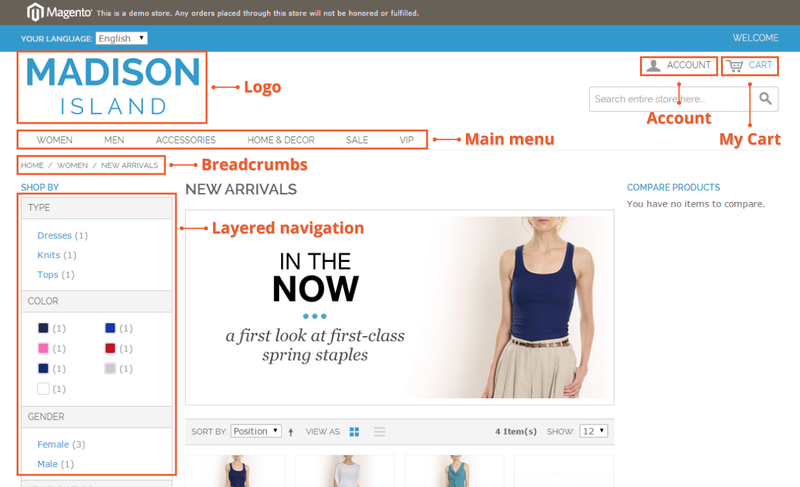 However, there is always room for perfection: use Advanced Breadcrumbs extension to allow store visitors to see the full path in breadcrumbs panel even if they come to the product pages by a direct link. LAYERED NAVIGATION is another built-in Magento option you should make best use of. In other words — it’s a filtering feature that is placed on the category page. 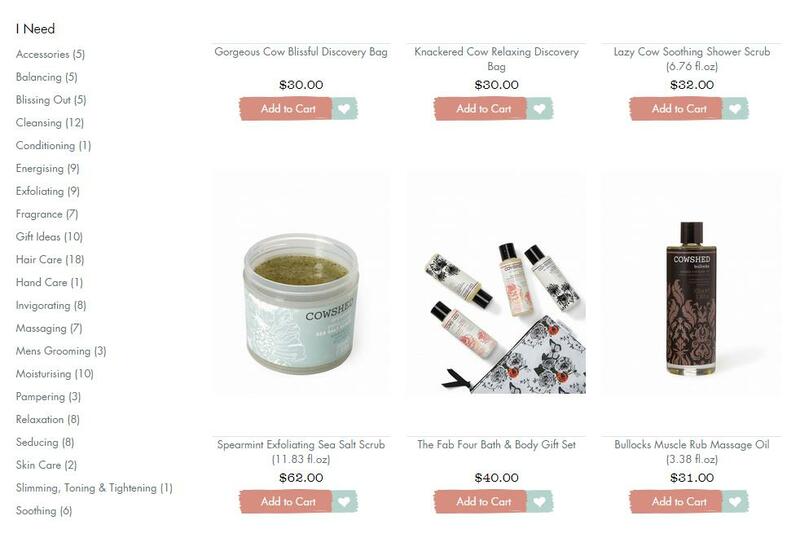 You can’t even imagine how it can reduce the pain of finding the right product especially when you have hundreds of products in your categories. In most of the cases it doesn’t require any fine-tuning, so there is no excuse for not using it. Let’s look how some businesses have implemented this feature on their sites. And again Amara are doing a great job by indicating exactly how many more options are hidden! By default Magento reloads the page every time you select an option in the filters, but there are many extensions for improved layered navigation that load the items with Ajax technology. The extension developed by MANAdev team allows you to display layered navigation horizontally. Utilize and enjoy! If you want to create an outstanding customer experience for store visitors, learn from Astley Clarke! Provide the user with more than one layered navigation option. 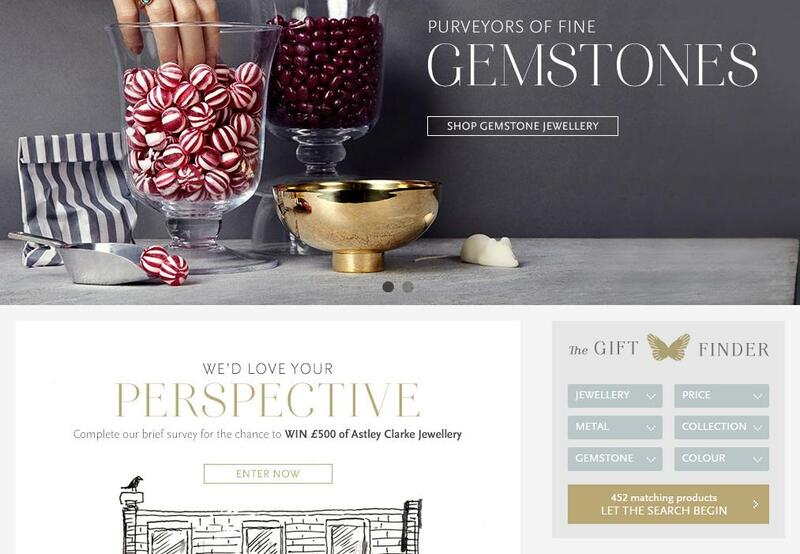 In addition to layered navigation on the category page they have placed a gift finder on the homepage. The only thing that we find inconvenient is that the finder doesn’t display what options you selected, it just highlights the parameter in a different color suggesting that you’ve already made your selection. 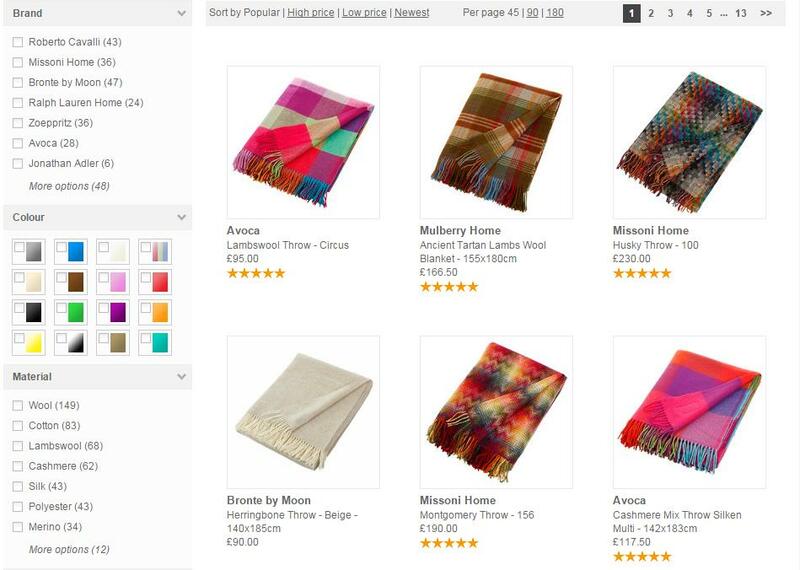 One more tip how standard Magento layered navigation may be improved: make the filter URL’s more SEO-friendly with Improved layered navigation extension by Amasty. The online store FOOTER is another place where users are looking for something they didn’t find in the primary navigation. Make use of footer space and place there less essential but still important things like terms and conditions, policies, that your customers might want to check. SITEMAP is probably not such a crucial element for online store navigation but it can be useful for the users who happened to get lost on the site. The primary purpose of the sitemap is to list down the site pages in a clear, hierarchical order giving a plain overview of the website. What’s even more important about the sitemap — it positively influences website visibility in search engines. It’s also a built-in feature in Magento, so no programming is required. The obvious one: plan thourougly your online store navigation structure. Ensure that all navigation elements are easy identifiable and consistent. Try to determine what kind of users will come to your site. Put yourself in their shoes and build “for” them. Try to minimize the number of clicks. Constantly track website traffic and improve store navigation in accordance with the results. There is no universal way to design navigation. Magento offers extensive navigation functionality out of the box, but it can be improved further with multiple extensions and custom solutions. 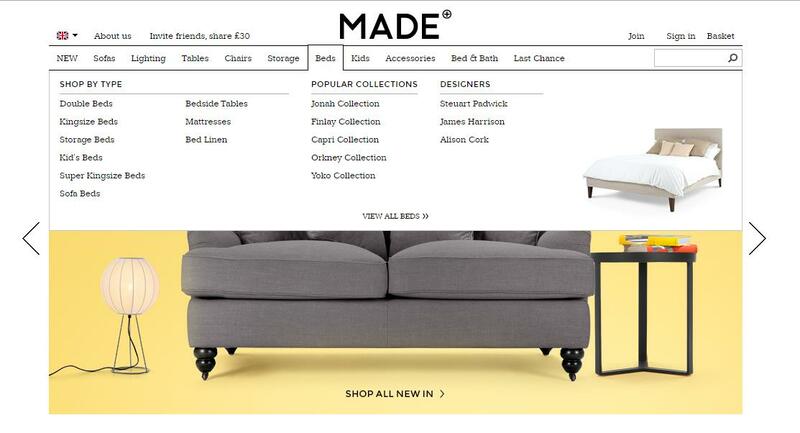 To create a clear and comprehensible navigation you probably would need some help from Magento web designers. Drop us a line, we will help you create a usable web-interface keeping your visitors engaged.